Who’s more superior?? Brain or the stomach?? Are you able to think when your stomach feels hungry?? 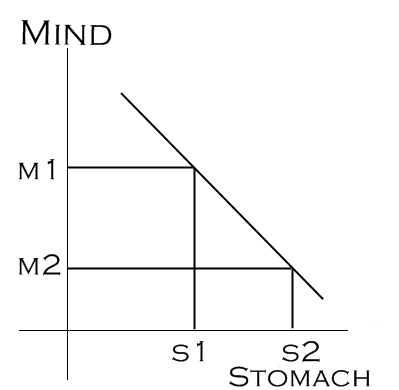 So… Stomach is superior to Brain as it is independent of it, while the brain is dependent on the status of the stomach. The given diagram (similar to Law of Demand) is self-explanatory. Previous Post HARDWORK! If everyone knows it, why don’t they do it? Hi I discovered your site by mistake when i was searching Yahoo for this matter, I have to say your site is truly useful I also love the layout, its wonderful!